In our BCI methodology, our covered call writing strategy has several guidelines and one rule. The rule is to never sell a covered call option when there is an upcoming earnings report prior to expiration. Some may ask why not? With the added volatility are our options not going to generate additional premium and if the report disappoints will not the premium help mitigate losses? True and true but the rule stands. First a little history. When I started teaching myself this strategy in the early 1990s I would find that periodically one stock’s price decline would wipe out my entire month’s option profits. I would always research the cause and more often than not it was a disappointing earnings report. I, like you, don’t like to lose money so ultimately I created the rule and the number of catastrophic gap downs decreased dramatically (they will, however, still pop up from time to time). What can cause a gap down? So what is it about these reports that can create a gap-down? Why is it that a company can have a stellar report and still decline in price? Market reaction, to a great extent, is based on analyst expectations or consensus. If a company’s earnings and revenues rose by 20% year-to-year but the market was anticipating 25%, look out below. Then there’s the whisper number. This is the unofficial, unpublished earnings forecasts that circulate among professionals on Wall Street. This number may be different from consensus and can impact market interpretation of a report. There is als0 corporate guidance where a company forecasts future earnings and revenues. This too can be a source of market disappointment. Finally, the report can simply disappoint and not meet consensus expectations. The point here is that so much can go wrong and we are generally conservative investors, using a low-risk strategy with capital preservation a critical goal. Why take the chance? The implied volatility of an option reflects the market anticipation of price movement by expiration. It is greater when earnings are due to be reported prior to expiration. Let’s say in a non-ER month a stock traditionally trades in a $4 price range. So a stock trading @ $38 can trade between $36 and $40. Writing a $40 call for $1.60 on an uptrending stock with strong fundamentals is a low-risk sound investment. Now let’s say earnings is approaching and the market is anticipating a drop as low as $30 or a move up as high as $46, a $16 range. Selling that same $40 will limit the upside to $2 but protect the downside by only the premium generated. We are exposed to greater risk when we had the date that could have been avoided. What if the report does not disappoint and I still like the stock? Time to get on board. You now have two months to use this great-performer after the volatility of the report passes. Never look back and say what could have been. But rather congratulate yourself for circumventing a potential disaster. The cash you would have spent on this stock didn’t go to waste. You used it with another financial soldier…a safer one. What if I think the report will be a positive one? Okay so now we’re getting away from covered call writing but I must admit that from time to time I will own a stock through an earnings report. Years ago I did this frequently with CSCO and AAPL with huge success. Although it is not part of our BCI methodology when a stock is owned through a report, we take full advantage of the positive surprise (the last few years there have been more positive than negative surprises) and then write the call after the report passes and get the best of both worlds. However, be prepared that you could be wrong and get spanked with this approach if the report disappoints. Never write a covered call on a stock with an upcoming earnings report. If you feel strongly about owning the stock through the report or own it in a long-term buy and hold portfolio, write the call after the report passes. Some stocks have weekly options which will allow you to write call up to the actual week of the report. For the week, the &P 500 declined by 0.2%. BCI: This site remains moderately bullish on the economy but is concerned about the upcoming earnings season given the severe weather conditions and shortened holiday season in the fourth quarter. As a result, I am tweeking my options sales to an equal number of in-the-money and out-of-the-money strikes. Hi Alan, this is Carlos from Madrid, Spain. 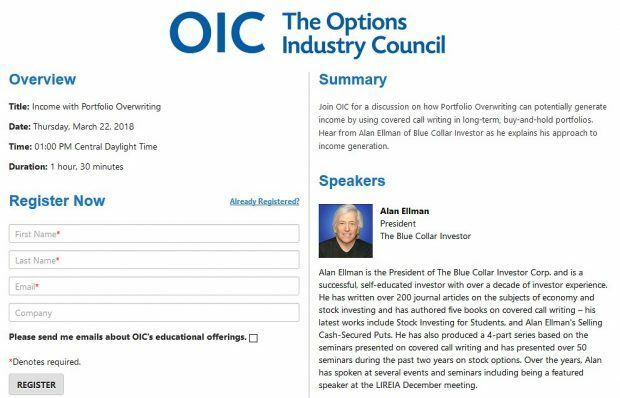 I recently became a Blue Collar Investor Member, and I am learning so much with your Lessons and your Exit strategies e-book. It is a privilege to have you as a mentor! 1-When choosing the strike price, I understand that we have to make sure that there is an open interest >100 and/or <30 cent spread. Also, using the Ellman calculator, and depending on our risk profile and if the market is bullish or bearish, we chose OTM, ITM or NTM strikes. But how do you choose the exact Strike price? For example, I buy a stock at 27$, and want OTM. What parameters do I take into account for selecting the 27.5 or the 30 or even the 32, 5 strike price? Do you look at supports and Resistances? Once you have selected a stock and the type of strike, I look at my monthly goal (2-4% in my case). The precise strike is then based on the strike that will generate the return I am looking for. 2-In an ITM strike price, if after the 4 weeks the stock’s value is below the strike price (and therefore the option is not exercised), what do you do with that stock? Do you sell it and assume the loss, or do you hold it for the next 4 weeks in hopes that you will recover, while selling another call? Or something else? If that stock still meets our system criteria, another option is written, if not the stock is sold and the cash put into a better-performer. Make sure all appropriate exit strategies were employed in the previous month…can be a good learning experience. 3-In a very bearish market, like 2008, do you still sell option calls every 4 weeks, or do you barely do it, choosing only those stocks that you are pretty sure might go up during that period? I recall in one of your lessons that you said it was better to stay away from the market in this situations, so I was wondering if you traded at all, since the 2008 crash lasted more than a year. I am vulnerable like everyone else. I didn’t move into cash until the last quarter of 2008. My stock portfolio was down 15% that year. The odds were stacked so much against us that employing every trick in the book couldn’t lead to a profit. The good news is that 2008 was an aberration and I was fully invested early in 2009 so I was able to take part in this bull market. In typical bear markets there are many tactics we can employ to maximize returns like selling in-the-money strikes, low-beta stocks, ETFs as underlyings and selling cash-secured puts to enter covered call trades. Some will buy protective puts as a hedge. 4-Finally, I can’t seem to find the Allocation Excel, could you tell me where I can find it? If you are referencing the Advanced Calculator…login to the premium site and scroll down on the right side (“resources/downloads”) to “Elite Calculator”. There is also a user guide there. This week’s Weekly Stock Screen And Watch List has been uploaded to The Blue Collar Investor premium member site and is available for download in the “Reports” section. Look for the report dated 01-17-14. 2- You will note that the stocks on pages 4 and 5 of the stock report that are in gold rows are not eligible until the earnings reports passes. Stocks AMTD through SYNA (6 more stocks) report in the first week of the new contract and will be eligible this week or early next week. Since the February contract is 5-weeks long, even if we enter a position on Monday January 27th, we still have 4 weeks of time value to generate. This now leaves us up to 23 stocks to work with (depending on option liquidity at the time of the trade). 3- Our latest ETF (exchange-traded funds) Report has 17 eligible candidates giving us a total of 40 securities to work with. As always, our team will screen for you weekly and look to uncover additional candidates which will be reflected in future reports. This week’s Weekly Stock Screen And Watch List has been revised and uploaded to The Blue Collar Investor premium member site and is available in the “Reports” section. There was a typo with XRS…it has an ER in the current month. Look for the report dated 01-17-14-RevA. My thanks and compliments to you and the team for a wonderful start to the New Year. Your stock selections have been superb. I have a friend and fellow subscriber copied on this note. We have a twist on your strategy: we call it “buy/wait”. Your picks have been so good so often we buy them then wait for them to go up further before selling our calls! The Technical Guys are looking for a breakout to around S&P 1885 if we get to S&P 1851. I am therefore liberal on writes for February. The ones I have done so far are well OTM.